Once a group leader reaches Level 50 and unlocks Veteran content, the option to switch the group between Normal and Veteran mode becomes available. This option determines which version of a Group Dungeon (or Dragonstar Arena) the group enters. Group Dungeons also scale to the level of the group leader. The number of players in a group dictates the amount of experience received. A group of two actually receives bonus experience compared to solo play[verification needed], but the returns decrease as more players join. The Grouping Tools tab allows players to passively look for a group to join. To join a group, you must select your preferred role(s) (Tank, Healer, Damage), if any. Group searches can be specified by listing which roles you're looking for, what size group you wish to join, what "activity type" (World, Alliance War, Dungeon, Veteran Dungeon, Trial) the group is for, and optionally the specific location of the activity. For World activities, use of the group finder is limited by level, and Alliance Zones are divided by subzone. 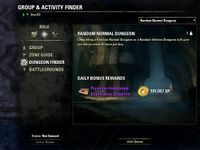 Following the changes in Update 8, groups created via the Grouping Tools for Group Dungeons can contain players from all alliances, and the dungeon and players will be battle-leveled to Level 50 160. This page was last modified on 12 June 2018, at 04:13.